(News Investigators) /Fresh facts have emerged on how the Boko Haram terrorists carried out the last week deadly attacks in Metele, Borno State in which scores of soldiers were killed. Soldiers of Nigerian Army 157 Task Force Battalion had suffered heavy casualty that Sunday November 18 when insurgents in a surprise attack invaded their base. Until last week attacks, the Army had recorded appreciable gains in the 9 year old war against terror, especially in the last 3 years of the Buhari’s administration. 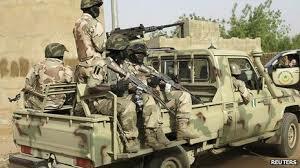 Military source told News Investigators that the insurgents played a trick on the soldiers on duty when it drove into the 157 Task Force Battalion Base located in Metele, in four vehicles unhindered having disguised as troops of the Nigerian Army. “The four trucks were mounted with machine guns and the insurgents were led by a captain. Soldiers at the various checkpoints close the base had mistaken them for our troops, because they all dressed in forest combat uniform, exactly the same as the Nigerian Army, and were also carrying the Nigerian Army weapons, same RPG, the source said. Adding that, after gaining entry into the premises, the invading insurgents who were wearing different officer ranks had demanded to see the commander of the 157 Task Force Battalion. “As soon as the ‘Boko Haram soldiers’ were ushered into the room where the commander was meeting with his 2ic (2nd in command), the terrorists shot dead both the commander and the 2ic immediately. “At that point, the insurgents had announced their true identity, they were chanting Allahu akbar as they started shooting and killing soldiers who obviously had already been caught off-guard. And since our soldiers at this time could not differentiate between the insurgents and real troop members because everyone is wearing the same type of uniform and carrying same weapon, it made the matter worse for us. They killed our men, shot and killed soldiers right inside the trenches,” the source lamented. “This is the second time our troops are being attacked this way. It’s a devastating attack,” the source added. Although, the casualty figure could not be officially verified as at the time of the report, at least 118 soldiers were reportedly killed, with 153 soldiers missing in the last week Sunday attack on 157 Task Force Battalion in Metele, Borno State. Rescue, treatment and evacuation team sent from the Nigerian Army 7 Task Force Brigade in Baga, that were dispatched to Metele, also came under heavy attacks leading to additional casualties. President Muhammadu Buhari on Weekend summoned an emergency security meeting with the security chiefs, to appraise the situation. The Nigerian Army spokesman, Texas Chukwu, could not be reached as at the time of the report on Sunday.